Insurance Awareness Capsule for LIC AAO, NIACL AO and Assistant Exam. Today in this Article we will Discuss about Insurance Governing Bodes in India - IRDAI, IBAI and Insurance Ombudsman, their objective and Functions in Detail. Goal: The main aims of IBAI are to encourage communication among the Insurance/Re-insurance Broker members and to support, promote, and protect the interests of the members of IBAI. I. It aims to provide an opportunity to the members for auxiliary education, training and research in all fields of insurance and re-insurance. II. It takes care of the interests of Brokers with other organizations. Insurance Brokers Association of India (I.B.A.I.) is the only Insurance Regulatory and Development Authority (I.R.D.A. )-recognized body of licensed Insurance Brokers. III. According to the Insurance Brokers’ Regulations 2002 outlined by the I.R.D.A., all licensed Brokers should be member of I.B.A.I. Direct Insurance Brokers, Composite Insurance Brokers and Re-Insurance Brokers are members of I. B. A. I. The General Insurance (GI) Council is a part of the Insurance Association of India. It regulates the growth of the general insurance industry and maintains high quality customer service. The GI council has also strengthened its ties with several international insurance associations. In 1957, the General Insurance Council was established under the Indian Insurance Act 1938. It designed a code of conduct to ensure fair business practices. The Insurance Act was modified in 1968 to monitor the flow of major investments and reduce solvency margins. After the General Insurance Business Act was passed in 1972, the constitutional body underwent nationalization. About 107 insurance providers merged and divided into four companies, New India Assurance Company Ltd, National Insurance Company Ltd., United India Insurance Company Ltd, and Oriental Insurance Company Ltd. As a nationalized body, the GI Council actively started business on 1st January, 1973. The institution of Insurance Ombudsman was created by a Government of India Notification dated 11th November, 1998 with the purpose of quick disposal of the grievances of the insured customers and to mitigate their problems involved in redresal of those grievances. This institution is of great importance and relevance for the protection of interests of policy holders and also in building their confidence in the system. The institution has helped to generate and sustain the faith and confidence among the consumers and insurers. An insurance Ombudsman is appointed for a term of three years or till the incumbent attains the age of sixty-five years, whichever is earlier. Re-appointment is not permitted. e. Non-issue of Insurance document to Customers after receipt of premium. I. The complainant can approach the Office of Insurance Ombudsman as per jurisdiction, for value of the claim including expenses not exceeding Rs 20 lacs, within 1 year from the date of rejection/repudiation/partial settlement of claim by the Insurer. II. The complaint shall be in writing duly signed by the policyholder or claimant/ legal heirs. III. The forum of Insurance Ombudsman does not charge any fees for filing the complaint. IV. The complainant should not have approached any other forum/court/arbitrator on the same subject matter of the claim. V. The ombudsman shall pass an award within a period of three months from the receipt of the complaint. The awards are binding upon the insurance companies. VI. If the policy holder is not satisfied with the award of the Ombudsman, he can approach other venues like Consumer Forums and Courts of law for redressal of his grievances. VII. There are Total -12 Insurance Ombudsmen Officer across India. Step -2. Search @licaaoexam and Join the Group. Step -4. 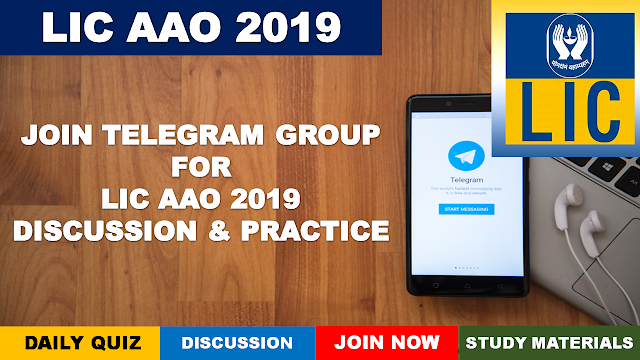 Interact and Clear your Doubts Regarding LIC AAO 2019.